If you’re looking for a great first recipe for your new Instant Pot, this is the one. 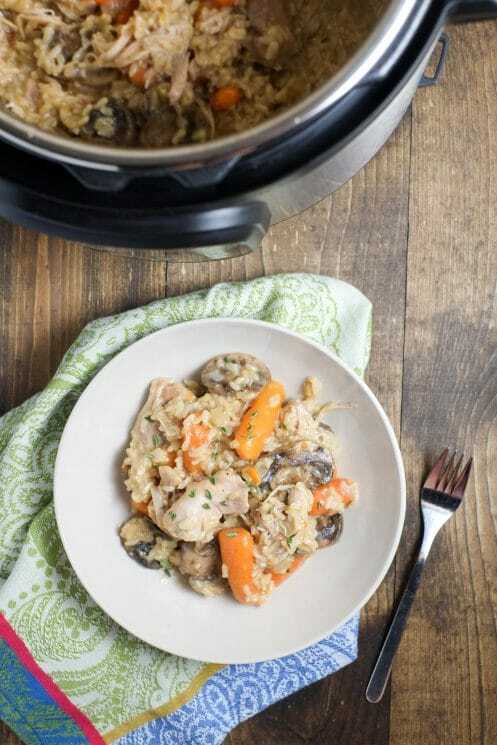 All-in-one instant pot chicken and brown rice is an easy, balanced one-pot meal for dinner ideas the whole family will love. We love how care-free cooking in the Instant Pot is! It’s easier to carry out your healthy meal plans with an Instant Pot! I have had my eye on an Instant Pot for a while now. They are kind of magical. You can use one appliance for pressure cooking, slow cooking, rice cooking, yogurt making, steaming, and a few other things I haven’t even tried yet. Pressure cooking is my new favorite way to cook! One thing I’m figuring out is that there is a learning curve for pressure cooking in the Instant Pot. Recipes will say a meal is “30 minutes” but neglect to mention the time it takes for the pot to build pressure or release pressure. So I am including all that for my fellow newbies. I’ve spent hours pouring over Instant Pot recipes and my user manual. It’s such a new set of techniques to master! But I love this recipe because it uses basic techniques that I’ve successfully replicated more than once! We love how low-effort the Instant Pot makes this meal! Chop a couple things, saute the onions (in the pot! ), then throw everything in and start it. It’s easy like a crockpot, only you never have to stir it like some slow cooker recipes, and it’s much faster! I the ease of slow cooker style cooking without the worry of leaving a pot on while you’re out during the day. This particular recipe is also great because it’s one-pot. To me, that is a huge win! Since I am probably getting rid of my rice cooker to make room for this appliance, I want to be able to cook everything together when I can. You cook your veggies, brown rice, and chicken all at once! Speaking of ingredients, we love this recipe because it uses such wholesome ingredients. With brown rice, veggies, and chicken you’re getting in three food groups and filling up on fiber, protein, and vitamins. Begin by plugging in your Instant Pot and pushing the “Sauté” button. It will then say “30” (meaning it will turn off automatically after 30 minutes), then about 10 seconds later say “ON” which means that it’s heating up. Leave it to heat up while you prep your veggies. Now’s your chance to dice your onion and mince your garlic. 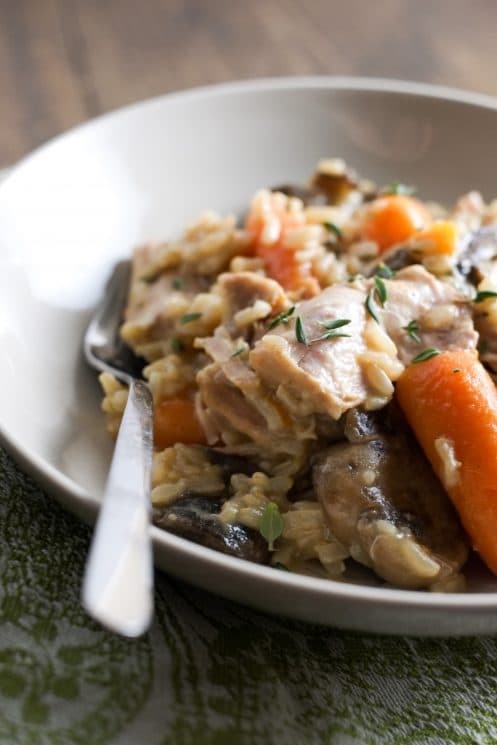 If you choose to use full carrots instead of baby carrots or have whole mushrooms, chop them now. Rinse and drain your rice. You’ll know the pot is ready to sauté when it says “HOT” and gives a little beep. Now splash in a tablespoon of oil and dump in your onion. Sauté about 3 minutes, then pus the “Keep Warm/Cancel” button to turn off the sauté feature. Dump in your veggies, garlic, rice, and broth. Stir it up a bit. Now layer your chicken on top. I used chicken thighs because they’re tender and provide more iron than white meat, but chicken breasts should work well too. If you do use chicken breasts, just cut them in half if they’re really large so they cook more evenly. Salt and pepper the chicken, pour your homemade cream of chicken (or mushroom) soup. Here’s the recipe I used and love. We definitely recommend homemade over store bought any day! Pour on Worcestershire sauce and top with 8 to 10 sprigs of fresh thyme. If you don’t have fresh thyme, I recommend mixing in about a tablespoon of dried thyme to the rice mixture in the previous step. Now close and seal the Instant Pot lid and set the valve to closed. Push the “manual” button, then use the “pressure” button to toggle until the “high pressure” light goes on (located just under the display). Now adjust the time to 31 using the +/- buttons. Now you can walk away. But know that your pot will take longer than 31 minutes to cook your meal! Mine took between 15-20 minutes to build up pressure, and then it started counting down. So plan on a little under an hour for your meal to cook. Once the timer goes off, you can either let your pot release pressure naturally or do it manually. Natural release means you don’t do anything and wait to open it for about 15-20 minutes when the pressure has naturally decreased. Manual or quick pressure release is done by switching the vent on the top to open. BE CAREFUL when you do this that your hand is not in the way. The steam will be high powered and hot! It takes about 2 minutes with the quick release. When your pot is open, remove the thyme stems and stir everything up. You may have what looks like excess liquid at the top, but it will mix in nicely. The mixing also helps to shred your chicken. It will be nice and tender, so stirring is all it takes to shred it! The ultimate all-in-one meal! 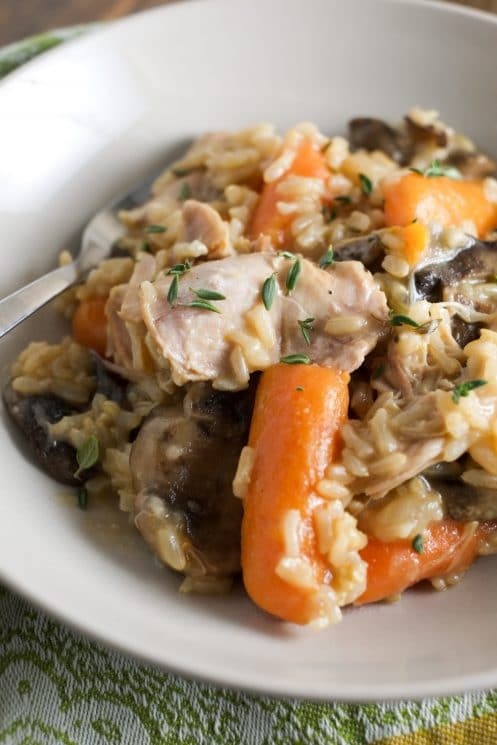 Let us know how you like using your Instant Pot to make Instant Pot chicken and brown rice. We think you’re going to love it! 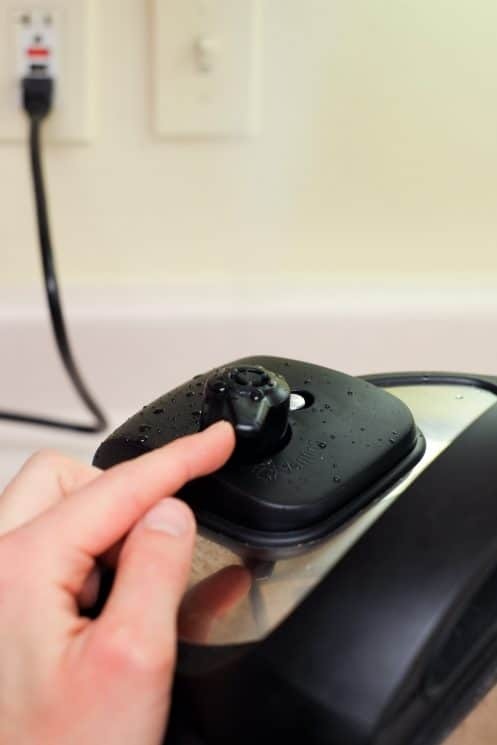 Push “saute” button on Instant Pot. While it heats, dice onion, mince garlic, and chop veggies. Rinse and drain rice. When pot says “HOT,” add oil to pot and saute onions for 3 minutes. Then press “cancel” to turn the saute setting off. Mix veggies, garlic, rice, and broth into the pot. Place chicken on top, salt and pepper, then cover with cream of chicken soup (homemade is preferable) and Worchestershire sauce. Place 8-10 small sprigs of thyme on top. NOTE: chicken breasts also work well, just make sure to cut them in half so they’re not too thick. Seal the Instant Pot, close the vent, and press “manual.” Use the “pressure” button to toggle to high pressure. For brown rice: set the time for 25 minutes. For white rice: set the timer for 20 minutes. After 10 seconds the pot should register that it has begun the pressurizing process. Once the pot is done cooking open the vent (keep your hand out of the path of the steam) to quick release the pressure. This should take about 2 minutes. Once pressure has released completely (the pin drops) the pot is safe to open. Thank you for your kind words – and let us know how it turns out! This recipe looks amazing! The problem is I don’t have am instant pot… Do you think there is another I could make it? Hi Marie! I haven’t tried it outside of the Instant Pot. I imagine you could make it on the stove in a regular pot, but it would require more liquid and longer cooking time. If you try it, I would use 4 cups of chicken broth (and check along the way to add more if needed) and cook it covered on the stove for around 50 minutes or so. But that’s just a best guess – let us know if you try it and what works for you! I’ve been afraid of brown rice and chicken because they have such different cook times in the instant pot. This seems like a long time! Does the chicken come out dry and over cooked? I would love to see more IP recipes! Hi Sarah, I totally understand your concern! Each time I’ve made it this way the chicken has been really tender – it just falls apart. Using chicken thighs and having the right amount of moisture seems to do the trick! I would like to make this tonight, as we are in the middle of the blizzard. I have chicken breast, carrots, broth and rice. I don’t have Worcestershire sauce or cream of chicken soup. First time using my instapot, wondering how I can modify this or if there is a simpler recipe out there for chicken and rice/veggies. THANKS! We have a recipe for homemade cream of chicken soup linked on the post that would be a great substitute. You can leave the Worcestershire sauce out and season with salt and pepper as needed. Good luck! Hi Ruth, I haven’t tried it in the slow cooker and I am unfamiliar with cooking rice that way. I am a little worried about the rice getting too mushy, but I have seen recipes where it is done on high for 3 hours, so perhaps that would work. If you do try it, just make sure to increase the broth so that you have at least a 2:1 liquid to rice ratio – maybe more. Let us know if you try it and how it works! make this last night. it was perfect! just a great comfort meal on a cold winter night. thank you! I am pretty sure 1/8 cup of salt is a misprint. 1/8 teaspoon? Hi Sharon! Definitely a misprint! Sorry about that and thanks for catching it for us! It’s an 1/8 teaspoon. Has anyone made this with chicken breast? Hoping my chicken doesn’t come out too dry. Sounds like a great recipe? Hi Lindsay – I haven’t tried this recipe with chicken breasts yet, so I can’t say for sure (maybe someone else can chime in?). 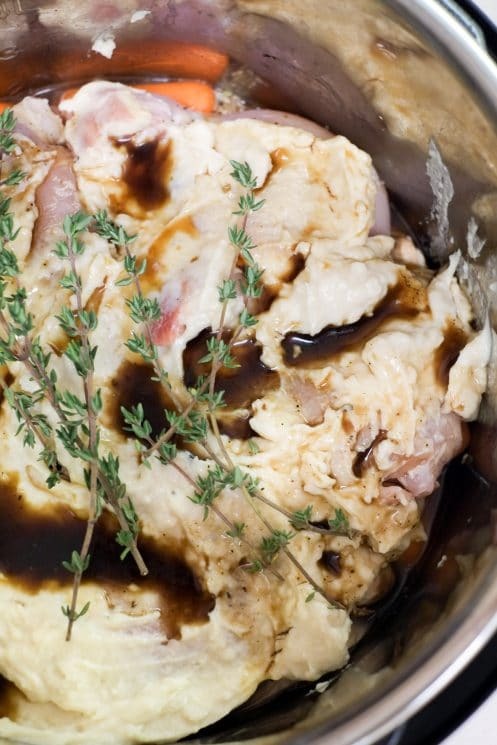 But every time I have cooked chicken breasts in the instant pot in any recipe so far they have come out moist – so I think they should work here too. Will you let us know if you try it and how it goes? Hope you enjoy it! Did you do it? I was going to try chicken breasts tonight and wondered if any adjustments are needed. Lindsay and Cynthia – I just made this again and tried chicken breasts. They worked great! I also found that the recipe works with less time (regardless of breast or thigh) – I used 26 minutes instead of 31. I’ll make a note and update the post. Thanks for the questions! It says in small print that it makes 8 servings. Hope that helps! If I wanted to make this more of a soup, I could just add more broth, right? Would that make anything else in the recipe wonky? Like the cream of chicken? I think that is a great idea, Jessica! I haven’t tried it myself, but aside from adding more broth I might add more seasonings so it doesn’t get watered down. Maybe just add some to taste after it’s done cooking? I think the cream of chicken would just make it a creamy soup – yum! I’d love to hear how it goes. I’m not sure how it would turn out without it – I believe it would be fine, it just would be less creamy and flavorful. If you omit it, perhaps just add a bit more seasoning and a dash more broth. Let us know how it goes! Hi Larry, Why did you make it a second time than? We’ve had so many people love this recipe, but if the flavors aren’t you thing, you probably shouldn’t make it twice! Hi Larry – sorry this didn’t work out for you! I’ll look at the fresh thyme measurement again to make sure it’s correct – I used sprigs, but the ingredients list it as a tablespoon which might not equate perfectly. I’ll take the leaves off the sprigs next time I make it and verify the amount. Thanks for your feedback! I agree. This tastes horrid (but cooked perfectly with 4 big chicken breasts). 31 minutes is waaay too long. Unless, you’re cooking for people with no teeth. I even used bone-in thighs, but all the vegetables turned to mush. I opted to skip the cream of chicken (was going to stir in some cream at the end) and added a tiny bit more broth to make up for it. Concept was good, recipe was bad. Hi Susan – sorry to hear it didn’t turn out for you! I was actually planning to experiment with a shorter cook time the next time I make it to see how it works. Each time I’ve made it my family and guests have enjoyed it, and the veggies haven’t been total mush (I don’t like that either!). Maybe it has something to do with leaving out the cream of chicken, the bone-in thighs and/or the extra broth you added? The size of my carrots and mushrooms were pretty large too, so that might impact cook time. I’ll update if I find a shorter cook time works better! I just made this for dinner again and tried using less time – this time 26 minutes. It worked, and the veggies were a little firmer. Next time I may even dare to shave off a couple more minutes 🙂 Thanks for the feedback! Have you ever doubled the recipe? If so do I double all the ingredients and leave the cooking time the same? Hi Kim, I haven’t tried doubling it, but I don’t think it should be a problem. Just make sure you don’t pass the max fill line of your Instant Pot. Yep – just double ingredients and the cooking time will be the same – amount doesn’t affect cooking time, just how dense the ingredients are. It may take a little longer to reach pressure, but cooking time will be the same. Hope this helps! Have you ever used frozen bone in chicken thighs? Should I increase the cook time and if so would it impact the veggies and rice? Thanks! ? Hi Aimee – I haven’t tried bone in frozen chicken thighs before so I can’t be certain, but I my guess would be that they will work with the recipe as is. According to the Instant Pot website, they recommend 15 minutes for thighs, so I think even frozen they’ll be done in 30 because you typically only need 5 or 10 more minutes. Just make sure they’re broken up and not in a large chunk. Hi Pey-Jing, the recipe serves about 6 adults pretty generously. Hi Alesha – as the recipe stands, white rice wouldn’t work. White rice has a shorter cooking time and requires a different ratio of liquid to rice. You might be able to get away with it by cutting the chicken into bite-sized pieces and adjusting the time down, but this would be out of my experience so far. The Instant Pot cooking time cheat sheet (http://instantpot.com/cooking-time/rice-and-grains/) says white rice needs about 8 minutes, for reference. Let us know if you find success! You had me until I saw cream of. How can you post this as healthy!?? This recipe tastes great and I loved how everything just goes together in the pot. I’ve been looking for dinner recipes with brown rice and was excited to finally find one. I used frozen chicken thighs so I upped the cooking time a bit, but it worked out. And I would add more carrots, but just because I really love cooked carrots and I wanted to eat more of them. Great recipe, great pictures, thank you! Thanks, Kari! Thanks for sharing how it worked with the frozen thighs. Glad you liked it! This looks so good!!! I’m totally putting it on my menu for the week. This recipe really looked good, unfortunately, no one in my family liked it. (A rarity, especially for my teenage son.) He’s a polite kid and would never say that he didn’t like what I cook, but the tell tale sign is when he refuses seconds, or thirds. I can’t understand why because we like each ingredient on its own. I appreciate how you give detailed instructions and I look forward to trying some of your other recipes. Hi Lola – thanks for your kind words despite it not working for your family. This recipe seems to really work for some people and really not for others – I can’t quite figure it out either! I hope some of the other recipes on the site work better for you. We just posted an Instant Pot Indian dish and a lasagna soup if either sounds interesting to you. Happy cooking! Before reading the comments and finding out it wouldn’t work for white rice, I used white rice instead of brown. The rice burned on the bottom and was a bit mushy. But….it still tasted great. Bummer! Yes, for white rice you’d need less time and less liquid I think, so that makes sense. But I’m glad the flavor worked for you! Oops. Mine is in and not pressurizing at all bc I did the same thing. I adjusted liquid ratio and cook time and am using breasts but I have a feeling it’s going to be more burned than I’d hoped. Smells great, though. Still learning on my IP so I’ll use this as a learning experience! It really is a learning curve! Hope it got to pressure or you figured out how to fix it so it would. Some recipes seem to take longer than others to pressurize – I think bigger recipes and high liquid volumes take up to 20 minutes, so maybe it was just taking a bit! Thank you for the wonderful recipe. I didn’t have chicken, so I made it per the recipe, but with beef and used beef broth and cream of mushroom soup. Turned out fabulous! Sounds delicious! Thanks for sharing your variation – I’ll have to try that next time! Thank you so much for your kind feedback Sylvia! So glad you’ve loved it and made it your own. I really want to make this tonight, but I’m a little put off by the fact that one of the ingredients in this “easy” recipe is, in fact, an entire dish that needs to be prepared first! Glad I read through the comments also, about not using white rice and being careful with the cooking time. With regards to the soup, I would definitely use a condensed store bought version. Can you tell me if I need to adjust the recipe using condensed soup as opposed to your recipe for the soup? Thank you for taking the time to share your instant pot experiences with us! I just now read over the ingredients again and answered my own question! No problem – store bought should work just fine. Hope you enjoy! Hello! This recipes sounds awesome! I am wondering though, there is just the 2 of us, and my husband does not like eating leftovers. Would this be a recipe that I could easily do for just 2 servings? Thank You! Hi Katrina I just made this recipe for me and my husband tonight and it turned out just great! We love it so much we’re going to dehydrate it and take it with us camping. I really appreciated your helpful directions on how to use the pressure cooker. I look forward to more from you. Thanks again for a great recipe ! How do you go about dehydrating your meals for the trail? That sounds interesting. Do you need a special dehydrator or would a fruit round dehydrator work? We tried this as our first instant pot meal, and it was amazing! I dont like mushrooms so we omitted those, but we did add celery. We also did the chicken breast suggestion. It came out perfect. Next time we are thinking of adding peppers and corn to make a Mexican version. So glad you enjoyed it. I love the Mexican version idea!! Have fun with the Instant Pot! This recipe was a hit in my house. My 18 month old devoured it. My 29 year old boyfriend devoured it. Thank you for the explicit directions as this was only my second time using the Instant Pot. We will definitely return to this recipe. Love this recipe! I’ve made it several times now! Today I only did 22 minutes manual pressure and I added peas. I also let my carrots, onions and mushrooms sauté for a pretty long time (while I made the mushroom “soup”) so they were caramelized and amazing smelling. Thanks! My 1st insta-fail. Lol. I don’t think it ever came to pressure. It counted down and I let it NR for about 10 mins but no steam released. I tried to add more time but the same thing happened. Only thing I can think of is that I stirred the soup in with the rice. The flavor was good but my carrots were still a little on the firm side. Have you had any other failures since? I just wonder cuz I’ve only had mine one month, but after 2 weeks, my silicon seal came out during washing and the pin fell out (that shows when it is pressurized), and after that things still kinda worked, but took longer. I returned it to the store and a day later when I was sweeping found the pin and the silicone bit on the floor!!! LOL! Anyway, I bought a different brand the second time which I like better anyway, so it was kind of a blessing in disguise. But it really messed up my cooking for a few days and left me quite confused. It would never seem to come to pressure yet it would count down and still cook! Just didn’t cook as fast and when I went to release, like you, almost nothing to release. FYI, my first one was the Power Pressure XL and the newer one I like more is the Instant Pot! What brand of brown rice? Was it minute rice? I am going to try this tonight. I have just one question. 787 calories per serving seems very high. That’s what I was going to comment about. That seems like such a high amount of calories for a chicken and brown rice meal. Hi Juli and Heather, you are absolutely right! 🙂 I have changed this to 8 servings so the cals have drastically changed. Enjoy! Thanks for the awesome recipe! I made your homemade cream of mushroom soup, except I made it with unsweetened cashew milk and it worked great! Also I made this recipe and used frozen chicken breasts and it worked perfectly! The chicken was perfectly done and the brown rice was just cooked. They weren’t huge chicken breasts, so that’s probably why the cooking times worked. I cooked it for 27 minutes and did a 10 minute natural release. Thanks for a great recipe! 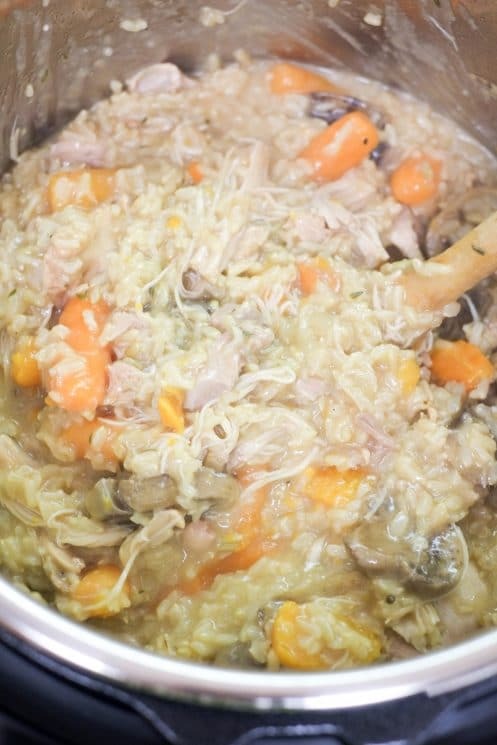 Do you have a recommendation for making his without the cream of chicken soup? I made this for dinner tonight. It tasted delicious, but I had a couple of issues. I must say I am new to the instapot – this is my 3rd recipe – so I have not figured out all the tricks. I am also single, so I often half recipes so I don’t have to eat them for weeks. I cut this recipe in half exactly and used chicken breasts (so I used two of them). I cut the cooking time down to 24 minutes, but the rice and veggies were mush. It tasted good, but the texture wasn’t great. It also stuck on one side and burned. Generally when I half a recipe, the cooking time is the same. Is the instapot different? Do you have to reduce cooking time if you have a smaller volume of food? Does that make sense? Usually rice takes the same amount of time no matter how much of it you cook, so I didn’t think to adjust the cooking time. Thanks for your help! So after reading all of the other comments…and checking my pantry, I figured out the problem. My rice is white not brown!! I thought it was brown rice but it wasn’t. My carrots were pretty big – I was actually worried they might not cook through. I think the extra liquid must have messed with the veggies. The chicken was perfect. I will definitely try it again and make sure to use BROWN rice. I found this by searching for what I had on hand–which included frozen chicken thighs. I didn’t have mushrooms, so I left them out, and I used fresh rosemary instead of thyme. What a delicious pot of comfort food! The chicken and rice were both cooked perfectly at 28 minutes. The carrots were a bit mushy, but that was perfect for my one year old. Do you use the instant pot measure cup? I made this for hubby and I for dinner today and we absolutely loved it! I am loving my Instant Pot also. This meal was simple and delicious. I am so glad that I found this recipe. We love brown rice, I did use boneless pork chops trimmed of fat because it was what I had available. It worked perfectly. has anyone tried this using white rice? i’m a broke college student and all I have is white rice. Love it! I had cooked chicken left over so I just added it at the end and stirred it in. The heat of the rice warmed it. can I just cut this recipe in half if using the mini instant pot? This was wonderful! Simple and satisfying. My kids even dug in. i’m surprised by those with negative experiences and wonder if their pressure cookers just somehow obliterated it. I did mine on 26 minutes, and though the rice was softer and stickier than we normally like, it was still very tasty and the carrots were just fine. Next time I may try 20 minutes and see how it turns out! Also I would like to experiment with white rice, but likely use 10 minutes. I saw a similar recipe (using chicken and white rice) and the cook time is 10 minutes. Thank you for a great and simple recipe! I bought cheap cheap bone-in chicken thighs and just skinned and de-boned them. Added extra time, but worth it for the cheap price! This was a huge hit, it was easy and quick. I used frozen precut onions and mushrooms. it was a great meal for camping. I use my insta pot for all my camping cooking and it was such a quick clean up. I’m just getting started with my instant pot. I really appreciate all of your details! Can’t wait to try this. Thank you for sharing this simple, yet wholesome meal. This meal was close to perfect the very first time I tried it and it will soon become a staple in my household. The only slight tweak that I will make is to marinate the chicken so that it holds a litle more flavor. But otherwise, this is a keeper. Thank you! This was great. I was careful with my dried time due to another comment. I’d say I used 1/2 tsp dried. I tried to keep my carrots and chicken out of the liquid to prevent over cooking, next time I might put the carrots in foil to slow them down a but as they were on the mushy side. I cooked 23 minutes. I also waited to stir in soup until it was done. Will make it again! I have a slow cooker, was wondering if I could do the rice separate on the stove top, and if so how would I need to adjust the recipe? Thank you for any advice you can give. ? Pretty good. I think I messed up on my InstantPot cook time so I had to cook it twice and use more chicken stock the second time around. I made a vegan cream of chicken soup and used a combination of almond and coconut flour. It tasted pretty good overall. This recipe is no good, I tried it twice and it burnt both times. The first time I thought that I used to much and didn’t scrape the bottom after adding the veggies, so I thought I would give it another try. This time I followed the instructions exactly and it still burnt. Ok – what did I do wrong? Followed recipe exactly but when I turn pressure on and pot steam valve locked I got five short beeps and “burn” on the display. Help! Thank you for the detailed instructions! This looks amazing!! I am going to try it today ? Silly question – do you cook the rice before putting it in? Can you use frozen chicken breasts? If so, does that change the cooking time? No sodium listed in Nutrition Facts.? so far this is the best tutorial of a beginner using the Instant pot!! Thank you! I seem to be doing something wrong. I followed the recipe exactly and my instant pot just kept saying “burn” I believe for insufficient liquid. I had to take everything out, the bottom of the pot was burned rice, and ended up cooking the meal on the stove anyway. Did anyone else have this problem? How long did you cook it for? And did you use brown or white rice? It needed a little “flavor” so I sprinkled with cheese for one meal and added ranch for another. Also, my IP did “burn” the bottom so I had to restart a few times. By the end of all the cooking the rice was more like porridge but the chicken was moist. I had no idea this wouldn’t work with white rice. Kicking myself right now. Really would have been nice if instead of spending 2 paragraphs going on about how this is the first time you’ve used the Instant Pot, you instead maybe warned people who use the IP because they typically can’t cook and would have NO idea to NOT use white rice. That way maybe you could save them 2 hours of grief when their rice isn’t cooking and another 2 hours of clean up when said rice is completely burnt to the bottom of their once perfect Instant Pot. Incredibly disappointed and wish I had read the comments first to save myself from this nightmare. What is the best way to cut this recipe in half? We are a family of 2 … love my instant pot but all the recipes I find feed us for a week and that’s not what I want! You can cut the ingredients in half and then you will also need to decrease your cooking time by at least 5 minutes. The first time I made it the pot said but, but till turned out ok. The first time I made it my pot said burn, but it turned out good. The second time I added an extra 1/2 cups of broth and it was perfect! I’ve read this three times and still don’t catch when and how I cook the brown rice? It begins with rinse the rice – which I always do but that’s raw before cooking. When and how do you cook the rice? Can it be done while you’re cooking other things or is it another operation and then is stirred in after it cools??? My instant pot had a burn error with this recipe. Maybe not enough liquid? Its possible. Did you use white or brown rice? Did you use white rice? Did you natural or quick release? Totally backfired. I tried this as my first recipe in my new instant pot. I think I need to toss the IP. I got an error message “BURN” When i released the pressure and opened it it was completely scorched on the bottom (black!!!) and the chicken was still raw on top. I used boneless chicken thighs and added some extra vegetables so there should have been lots of liquid. I don’t think the IP can be salvaged. So sorry about this Heather! We have cooked and tested this many times, but since it sounds like it has been a problem for a few other people we have updated the times for this recipe and included brown and white rice times. The cooking time seems excessive. I normally cook 2 chicken breasts (about 1.5 lbs) for only 10 minutes on high pressure, manual release. And it’s always cooked fine. I’ve seen other recipes only cooking smaller cuts of chicken for 5 – 7 minutes. I’m thinking maybe i need more liquid? Did you use white rice? Also did you natural pressure release or quick release? The traditional conversion of fresh herbs to dried is 1/3 so 1 tablespoon of fresh thyme should be 1 teaspoon dried thyme, this might help some people out! My family is split on this one. I liked it but my hubby was meh about it. I love your blog & use many of your recipes for my family of 7. Unfortunately this one was a flop for us! There was not much taste and turned out to be kind of mushy. I tired adding a few seasonings, but it didn’t help. we tossed it and ate cereal for dinner. As others have asked what adjustments would be needed to remove the cream of chicken soup? We want a healthier version and avoid dairy whenever possible, so the homemade recipe isn’t the answer for us. However, this looks great and we’d like to try it but I’m worried the cooking time and/or liquid volumes will need adjusting without the cream of chicken soup. Thanks! You will definitely need to replace the liquid from the soup with an alternative. You could add a dairy free milk – coconut, almond or soy would all be good alternatives. You could also try adding silken tofu as a replacement. Can I make this dairy free?! Total fail. Ended up with a burnt mess on the bottom of my pot. I used white rice, but there was plenty of liquid. First time this has happened to me. Very good! I used chicken breast cut in a few pieces. I will be making this again. Made this last night and it was delicious! I was a little nervous because it was only my 2nd IP recipe but it was perfection for a cold night. I used 2 large chicken breasts and cut them diagonally (shredded after done cooking) and instant organic brown rice. I only high pressure cooked for 15 minutes because it was instant brown rice and it came out perfect!!! Did you cut the chicken breasts in half like butterflying or in half across length wise. Looks delicious. It depends on how thick your chicken breasts are. If they are really thick you could butterfly, otherwise just cut in half lengthwise. 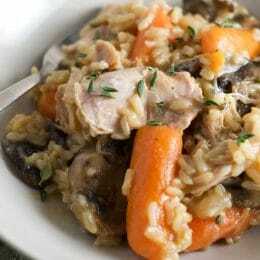 This chicken and brown rice dish was terrific and pleased the family ages 6-72. I used the homemade mushroom soup and skipped adding mushrooms. The fresh thyme is worth every penny. Next time I’ll double the carrots, add celery and maybe some red bell pepper and after pressure cooking stir in some frozen peas. We like LOTS of vegetables. Remember to start the instant pot about 70 minutes before serving time…it took a long time to come up to pressure. GREAT RECIPE! How much is one serving? A cup? Cup and a half? Tried it tonight using chicken breast and it was delicious! My instant pot kept saying burn, and here the rice burnt on the bottom. Any suggestions? I followed the recipe and don’t understand what I did wrong. I did use Jasmin rice, maybe that was the issue? Oh yeah! Second time I have made with my instant pot. Thank you for the idea of homemade cream of chicken soup. So easy so delicious. Who knew, I stopped using these canned soups years ago, but it was incredibly easy to make, so I followed your recipe and suggestions, came out perfect. Made this for dinner tonight. With a few changes. I made 1.5 cups of rice, (decreased the liquid accordingly,) just water as I was out of broth and I also used boneless pork chops instead of chicken. Both the meat and the brown rice were cooked, it was creamy and satisfying!!! I would make this again. Thanks for the recipe. I wondered if you had any suggestions as to something I could use next time instead of canned soup? Hey there! I’ve been steadily trying every lovely recipe for my instantpot for two months straight now! I love the sound of this recipe but I’ve only got chicken legs. Do you think they would work? Im a little nervous!!! Making this tonight but I only had 1 lb of chicken breasts… I still cut them in half, do you think it will still turn out ok??? I guess there’s no turnin back now! Haha! I’m extremelyyyy excited to eat this though!!! Easy to make, and I followed the recipe to a T, but everything seemed a little over cooked and my rice burned on the bottom of the Instant Pot. My daughter (18mo) loved it, but my husband and I had to add more seasonings as it was a little bland. I will definitely make this again, but add more seasonings and broth and cook a little less time. Does the cooking time change if you half the recipe? Thanks! We loved it super easy and no problems making it. This is my 5th IP recipe and I appreciated your detailed instructions for using the Instant Pot. I followed your recipe as written (other than forgetting to add Thyme) and it was delicious. Thank you, Katrina – keep posting more recipes! This was delicious! I used chicken breasts and it was not even close to dry!! I had Brussel sprouts, so I used those instead, and I didn’t have thyme, but I just sprinkled some Italian seasoning on the top. I usually never comment on these type of pages, but honestly, I’m kind of shocked by the dislikes and the rude/ negative comments (if you don’t like it…move on! ), so I wanted to tell you it was amazing and rock on girl! I’ll be looking for more of your recipes! I have the 6 qt IP with no “manual” button. What button do you press instead? Just set it to high pressure for the indicated amount of time. I made this last night and loved it. I want to try it with pasta the next time around. I can’t find any good recipes that are similar to yours. Any suggestions on how to use pasta instead of rice? Thanks! Although this is not my recipe, I would just omit about half the liquid and simply cook the pasta on the stove. You could also cook the pasta a night or two ahead and then it would be ready by simply warming it up. I also like to cook and freeze pasta to use in a pinch! Good luck! I followed this recipe exactly, but it just didn’t turn out right. It had fantastic flavor, but the rice didn’t quite cook, and stuck badly to the bottom of my Instant Pot. I’m not sure if my IP actually came up to pressure though, because it didn’t let off steam when I turned it to venting. The chicken was cooked though. I ended up adding about a quarter of a cup more water, and some frozen broccoli, and popped it in the microwave. I’ll definitely try it again. Thanks for a tasty recipe! First recipe I’m trying in my instapot. 2 questions: Should the chicken be frozen or thawed? Is the rice instant rice or regular? I also cannot get the adjust button to register less – normal – more. We have made the recipe with thawed chicken, but I would be curious if you could use frozen! Also, definitely regular rice. Brown rice has been the best in our recipe testing. Good luck! Like many posters here, I want to try this recipe without the hassle of making the cream of chicken soup or using canned soup for this. One suggestion was to use some sort of dairy to replace the liquid in the homemade soup. Has anyone tried this successfully? Would it be an ounce for ounce replacement or is there another adjustment? It seems that many of the ingredients in the homemade soup could just be added to the instant pot with everything else before cooking. I’m really interested in this concept and am hoping someone else has tried this successfully. Katrina, your instructions were so clear and precise! We used your all-in-one-instant-pot-chicken-and-brown-rice recipe for our very first Instant Pot all-in-one meal, and it came out perfectly! We have the large 8-quart pot, so we added a few additional vegetables to fill the pot up a bit more. We can’t have mushrooms, so we substituted 2 cups of diced (unpeeled) eggplant, because the diced eggplant is similar in constituency to the mushrooms. We also added 1 small red pepper and 1 small green pepper, diced. The rice we used was Trader Joe’s Rice Medley. Thanks so much for a great start to our new Instant Pot! Glad you loved it Denise! Made this tonight. 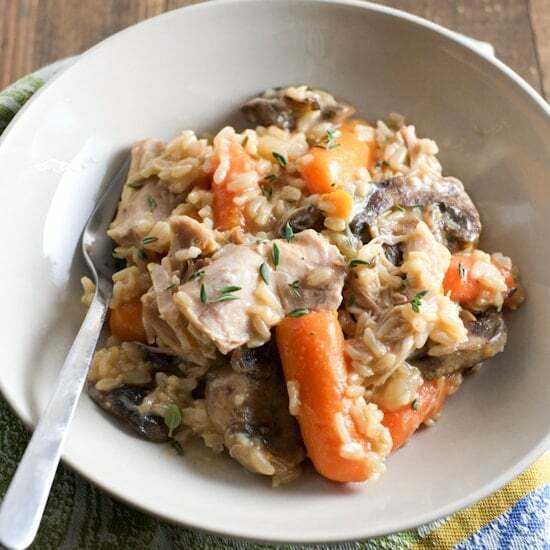 Used only 1 cup of brown/wild rice combo , 1 cup chicken broth, no mushrooms (didn’t have them), FROZEN chicken breasts, cream of mush soup, everything else the same (carrots, celery, spices). Cooked in instant pot for 20 minutes high pressure with quick release. GOOD, GOOD, GOOD! Fed 3 of us with at least 2 lunches leftover. thank you so much for explaining the recipe in detail. I just purchased my instant pot and was still not sure what all of the numbers and buttons meant. I read 5 recipes Before finding yours that explained it so well. Hello you gave the caloire count what size portion is it ? I just made this recipe tonight and it was wonderful!! I especially love your quick cream of chicken soup! It was simple and perfect for this recipe. We will definitely have his again! Thank you! When using chicken breasts opposed to thighs, is the cooking time reduced? Other IP recipes I’ve seen for chicken breasts say to cook on high pressure for 10 minutes. I don’t want to do 26-31 mins if it is going to dry out the chicken. Thanks! This recipe is perfect. Thank you!!!!! Love this recipe, would it work doubled? I use an Instant Pot, wanting to make for a potluck tonight. Would doubling change the cooking time? Thanks! I made this Sunday after church and it was a big hit with my husband who is a picky eater. It was so simple and with little effort but yet amazing and yummy!!!! We tried this recipe last night and followed it exactly, and it came out perfectly! This is only the second time we’ve used our instant pot, so all your instructions were so helpful! We used the chicken breasts and cooked for 25 minutes, like the recipe said. Not sure how so many people are burning this or upset when they don’t follow the recipe and substitute things and it doesn’t turn out like it should. We will definitely make this again! I will probably add more seasoning as it was a little bland, but overall great recipe! I loved this recipe!! I added a handful of basil with the thyme aswell as some majarom. I also added 2 bay leafs. I think next time I may add more veggies or serve with a side salad. But overall this was delish!! Thank you for the cold day idea!! Is there a nondairy substitute for the cream soup? We keep kosher and don’t mix dairy with meat/poultry. There is a link In Katrina’s description above to making your own condensed cream of… soup. I used this basic recipe but used coconut milk beverage, and you could use almond, rice, soy, etc. milk. I think it would be best with a completely unsweetened type. Even unsweetened rice milk can be kind of sweet and would taste weird. I also just used coconut oil without the butter. I added a little garlic salt for flavor. I also sauted some onion and chopped fresh parsley and celery before adding rice flour and the liquids. Excellent flavor and completely dairy free and gluten free. Not sure what went wrong – I tripled the broth, yet it burned. Like really burned, couldn’t even scrape the bottom and keep going with the IP. Trying to finish the cooking in a pot on the stove, but would really like an idea of what went wrong, it seems like it should have been a great recipe, based on the other comments. Can you tell me how much saturated fat per serving??? This recipe looks Delicious!!! Can’t wait to try!!! Thanks and Have a Great Day!!!! ? Thank you so much for the recipe… I like to tweak recipes to what I have available and what I can have on my special diet. I cannot have the canned soup, so instead I put in teriyaki sauce over the chicken and I did add a little more broth for the brown rice. I also added broccoli. It turned out delicious.. This is so good. I have made it three times in last two months. Great Sunday Dinner! Has anyone tried this with skinned bone in legs and thighs? If so what is the cooking time and how did it work? This recipe sounds wonderful but I only have bone in chicken. This recipe was a hit with my family! Thank you! I used almond milk and whole wheat flour to make the homemade cream of chicken soup. I will probably use chicken thighs next time, but only had chicken breasts on hand this time. Hii was wondering if anyone else had a problem with their instant pot saying “burn” when it wasn’t even ready and maybe like 5 mins in to even putting lid on and starting. Yes, same exact thing happened to me and I followed the recipe exactly. I ended up having to finish it on the stove and the rice was so mushy. 🙁 The instant pot pan had a layer of hard, dark rice on the bottom and I had to scrape forever to get it off. I made this and followed the recipe to a “T” and I got the “burn” 3 times, even after scraping the bottom clean and adding more broth, etc. Had to finish on stovetop. Sad about this, not sure what went wrong. Very disappointed in this recipe, with a total WASTE of all organic ingredients too !! ” Burn ” notice !!! Set this recipe for delay and came home to burn. This recipe is trash. You need to clean the pot after the sautéed. Ruined our dinner. Taste was phenomenal. My kids actually loved it but next time I will dice the mushrooms for my picky eater. The only issue (which I expected) was that I had way more than 4 servings. No issues using breast meat either. Pic is after serving 5 people 3 adults and 2 children. I made this last night with cubed chicken breast at high pressure for 26 minutes. It turned out perfect and was delicious!! Thank you so much for this wonderful recipe! This truly sucked! Rather than savory, this had a bright, tangy, citrus flavor that was at mortal combat with mushroom, carrot and garlic flavors. I cook and the family enjoys all sorts of flavorful, ethnic foods. This was a frankenstein that nobody wanted any part of. Oh, and it’s been impossible to get the Thyme/Garlic/Mushroom smell out of the instapot ever since. UGH! Hi there! I tried making this tonight and had the “burn” notification come on. I don’t have a “manual” option on my instant pot, just a “pressure cook.” I put it on pressure cook for 20 minutes and it burned in about 10 and all the liquid was dried up. Thoughts or suggestions? Thank you! This looks like a great recipe until you hit the can of condensed soup…how is that aligned with “super healthy kids”? That is a highly processed product with very high salt content. I was a bit nervous to try this considering so many people had “burn” notices. My thoughts on that are when they added the cream of chic (homemade or canned), my guess is that they stirred the soup mixture into the pot, rather than leaving it on top. Generally, milk in the IP is a NO-NO…because it will scorch! I was scared to add the milk item and decided to cook the everything in the IP and add the homemade cream of soup once it was all done cooking. It worked just fine, no burning and plenty of liquid. ( I also try and get my chicken to the bottom of the pot). I added frozen peas once it was done cooking. I cooked for 24 minutes, and the chicken and brown rice were both cooked through. However, we did not care for this dish. It was kind of bland, and the carrots did not taste good in it. Also, since I was trying to follow the recipe, I decided not to salt and pepper the chicken. That was a mistake. And if I were keeping the recipe, I would plan on browning the chicken, setting aside, and then saute the veggies. Then add the chicken back to the pot. I really wanted to like this since it was a one pot meal, but just couldn’t. We ate it for dinner but the leftovers will get tossed in the compost. Don’t understand why people are getting a “burn” notice? We have made this exact recipe at least 10 times and always comes out perfect. Tastes great! We have used breast and thighs as well as frozen solid and unfrozen chicken. Always perfect. Don’t stir it people! Can you use a regular pressure cooker? Not an “instapot”? Yes – that should work just fine. I’ve only had my Instant Pot for 2 months. This was the second recipe I made with it. I was looking for something on the healthy side and for brown rice in particular. This recipe is now a weekly dish in our house (2 adults)! I stick to the ingredients and instructions exactly but I try to use more low sodium and low-fat options. I use no-salt added, no saturated fat chicken broth, low sodium-low fat cream of chicken soup, and the lowest sodium Worcestershire sauce (low anyway). I do not add any salt to the recipe. Also, I use 4 small-to-medium carrots (washed and unpeeled) that I cut at add; I think this enhances flavor! (Bagged baby carrots are only cut down rejects, anyway). I’ve also variated the types of mushrooms and they’re always good. Chicken thighs are much more flavorful than breasts for this. For me, this has come out great each time and we love it! It’s also our regular left-overs night dinner as well. Get out the Mrs. Dash flavors when serving! Great feedback! We are so glad you enjoy it! Thanks for the recipe, Katrina. I’m going to make this tomorrow, can’t wait. Really appreciate the step by step directions. This was great! I added green peppers and chicken thighs with bones and skin. I was worried that 2 1/4 cups of broth wouldn’t be enough liquid, and admittedly I like brown rice that is extra moist so I added an extra 1/2 cup of broth. It would have been fine either way I think. I have a Power XL pressure cooker so I adapted the instructions slightly. If anyone else needs instructions for an XL, there is no “saute” button, but if you select 25 minutes cook time, the pot starts to heat and you can saute your ingredients before putting adding the rest and the lid on. It will begin the countdown once it reaches full pressure. The chicken turned out great and fell off the bones. Thank you Katrina! Girls loved it. Made a ton. Needs more salt and pepper next time. A year and a half later and I just made this recipe. Perfect and delicious. Used brown rice and chicken tenders. the times listed were exact for me. thank you! I made this and I loved it! I was wondering if you had any pointers for using yellow rice in place of white or brown. We haven’t tried that! But let me know. Even your shortened cooking time is really long. I cook chicken from frozen in about 20 minutes in my IP & rice takes about 6 minutes. Interesting recipe, though. Might try it one of these days. This burned for me…my INstant pot doesn’t have a Manuel setting so I pressed pressure cook and then set the timer for 20 minutes. My chicken is raw and my rice is burnt. The bottom kept burning on the pressure cooker and forcing the pc to go to warm. Smells delicious, but have had to go out and get something to eat, and finish cooking this on the stove. Anyone else have the bottom burning problem? Hey, I followed the recipe exactly and the pot cane up with a burn notice. This does seem like a small amount of liquid for that much rice. Did anyone else have this problem? If i were to omit the chopped mushrooms, how would it affect the recipe? Hello – My husband is not a fan of mushrooms. What would happen if I omit these? What should I replace them with? It would still be good! Super great, works as written, but I’ve also done it with frozen chicken breast. Made the recipe. Turned out fine. Used chicken breasts. The carrots were a little mushy. Will use more chicken broth next time. What would be the time to cook this in a crockpot instead of an instant pot? And would it be recommended to dump all the ingredients and cook? Burned. You should take this down. From the other comments this is happening to too many people. You’re wasting people’s time, money, and I hate seeing meat wasted. We have tested this recipe many times, and it all comes down to the type of rice you use. It is honestly one of our favorite recipes and we make it on a regular basis. I’m so sorry it didn’t work out for you! First ever instapot recipe. Turned out PERFECTLY exactly as written. HAvent eaten it yet, but it smells amazing and just needs to cool a bit. The chicken just falls apart! Can’t wait! That is great to hear – we love this recipe! Hi! Do you have a suggestion if you don’t want to make this creamy? Could you add more broth or?? Would love to try this recipe! Also has anyone tried it wo rice? Absolutely wonderful! Not sure why it’s burning for some but mine turned out perfectly twice now! Kids ate it all up with requests for seconds! This is my favourite instant pot meal. My mom and dad request it every time we go to visit, I always bring a full batch and they eat it for days. I’ve made it at least a dozen times and it has turned out perfect every single time. I change the veggies up depending on what I have in the house, but it is almost always the mushroom, corn and carrots that family requests. My sister got an instant pot *because* of this recipe. I’ve never had any burning! Very good! Very versatile. Love the brown rice. I do have one question, how much is a serving? I try and track my macros and calories and have guessed at 1 1/2 cups? Thanks! So delicious and easy to make! My kids loved it and since Santa hasn’t brought me an InstantPot yet, I made this without one (with some modeifications) and it was perfect! Thank you for the great directions! Oh, and that cream of chicken soup??!! Aaah I could’ve just eaten that by itself!! I didn’t have any mushrooms so I used a mixture of mushroom and chicken broths and still added the diced onions. After not one, not two, but 3 burn notices I gave up. Totally ruined my evening. Now im up RECOOKING rice as the original rice had raw chicken in it, qnd roasting my chicken thighs that still have bits of soggy rice stuck to them. Not your fault, likely some fault of my own but thoroughly disappointed. We have tested this recipe with our team a minimum of 15 times and have yet to be able to repeat the ‘burn shutdown’ some of our readers have mentioned. Would you be able to run us through the steps you took so that we might be able to give some tips to avoid this? Thank you!!! Can you use white rice instead of brown rice? Could you use wild rice? “Burn” message on every attempt. Oh darn! We are so sorry about that because it really is a solid recipe and so delicious! Does instant brown rice work or do you need a different kind? 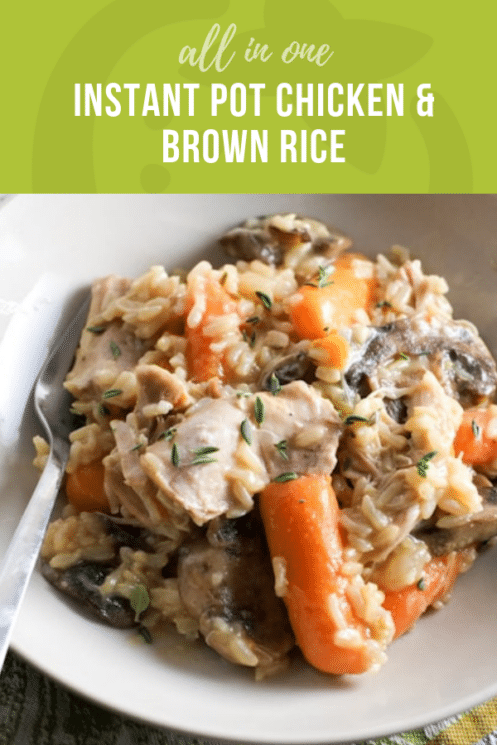 We have tried it with instant brown rice and it turned out great for us! I’ve made this for almost a year and still love it! We only got the burn notice once- when I didn’t stir everything together well and add 1/2 cup more broth. Make sure chicken is on the bottom and do not overcook.. I put my frozen chicken thighs in for 26 min- not frozen for 23 min..less time if using white rice. Hope this helps! Great recipe…..I had made this last year but the recipe didn’t save for some reason…. so had trouble trying to track it down….only thing that would be better is if I can use frozen chicken breasts but I was afraid it would burn or not turn out so I thawed them first. I used 3 large Costco chicken breasts & can of Cream of Chicken soup. I did cut them in half too. I have used frozen chicken breasts, and it turned out just great! Anyone substituted quinoa? If so what cooking time did you use? Help! What am I doing wrong? I’ve tried this 3x now and keep getting a burn notice and my brown rice is burnt to the bottom of my pot. Any ideas? We have tested this recipe over a dozen times and haven’t been able to replicate the burn notice. Did you stir the chicken broth it well before putting the chicken in? I’m also getting the burn notice about 4x in a row. I’ve taken everything out of the pot, deglazed the bottom, added more liquid and add everything back to the pot, add more liquid, again, set pressure to low this time, and still burns. So sorry you have had this happen. 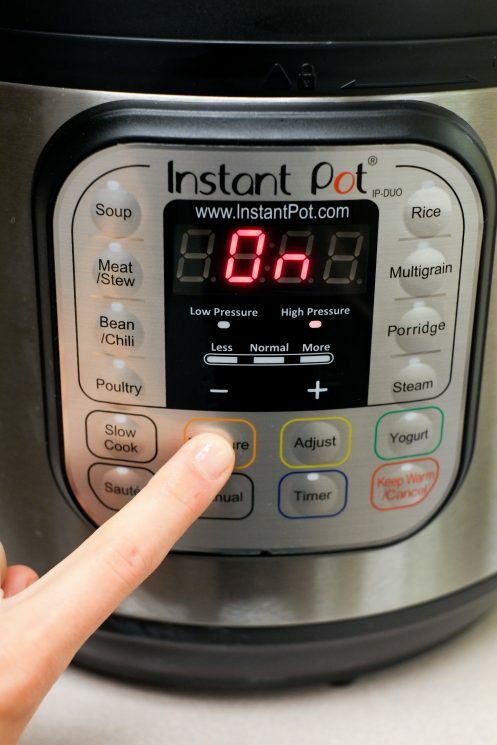 The more I use my instant pot, and teach others to use theirs, I am realizing that all brands, sizes and age of the instant pot, can all be reasons to adjust the recipes. For this one you may want to try reducing the time you cook, being sure that all ingredients are fully mixed together. Also, check your manufacturers instructions. Thank you for posting this! I’m brand new to Instant Pot (apart from some hard boiled eggs to test the pot, this was only my third real dish in the IP). It turned out great! No problems at all. I think the “layering” is important, so you get the easy to boil liquid at the bottom and the thick soup way at the top. I do think 25 mins might be on the long side, will try with 20 mins next time (using Brown Rice). But the whole family came back for seconds, and that was after eating all the the mac&cheese I had made for lunch (another IP experiment), so I couldn’t be happier with a recipe! I’ve never gotten the Burn notification on my instant pot before, but this recipe did it. I did a frozen bag of broccoli instead of carrots, water instead of broth, and added cream of mushroom instead of regular mushrooms. Bummer. I should have paid attention to other comments. Hi Bekah, so sorry this did not work out for you. You may also want to check your manual in regards to ingredients. Not enough liquids and creamy ingredients can cause the instant pot to register the burn notification. I hope you try it again sometime. Yummy, and kinda congee-like. Mine came out super rice heavy. I was expecting the recipe to be a bit more veggie loaded, but all in all it turned out good! I also had trouble with the burn feature. This recipe looked soo good that i tried it twice with a burn result both times. I just read an article on the Burn issues and learned that Burn appears a lot when a recipe was written for the 6 QT IP and the users has an 8 QT IP. I was using the * QT IP so I cam going to try this again with more liquid. I am also going to skip the saute step in the IP and just do it on the stove. Wish me luck! Good to know – and good luck!! Made this as my first Instant Pot Recipe and it turned out great! Thank you!! Only the third meal I’ve made in my new Instant Pot. Followed the recipe and it turned out great! All three kids liked it, too! Thanks! Another burn fail here. So disappointing and a waste of time and money. Never mind hungry kids! I did use white rice but otherwise followed the recipe and instructions exactly. Hi Rachelle, wild rice has a cooking time that’s more similar to brown rice than to white rice, so if you’re using a blend, I would try the recipe’s recommended time for brown rice: 25 minutes. I received the burn notice as well. I was starting with the 26 min for brown rice recommendation. Once it reached pressure, the burn notice came on. I used the minus sign to decrease the cooking time. Once I got to 18 it started cooking and the burn notice went away. I experienced the same burning many other commenters noted in their reviews and ultimately the garbage disposal enjoyed this meal. I have the large 8qt Instant Pot (purchased this week) and attempted to make a double recipe (all ingredients just hitting the 1/2 line). The flavor from what I did taste was great but unfortunately the rice burned to the bottom of the pot four or five times as the pot tried to come up to cooking pressure while I attempted the recipe. In the end I gave up and ordered out. First time using my Insta pot. This recipe turned out perfectly. I added a ton of additional vegetables. Cauliflower, celery, broccoli and a tomato . Then topped it with shredded cheese and sour cream. Delicious . Sounds delicious! Thanks for sharing Jacqueline. This was our very FIRST Instant Pot recipe ever. We followed the recipe to a “T” and had zero problems with “burn” warnings and the final product was delicious. Thank you so much for this recipe it’s the first in our new Instant Pot recipe box. I have an Instant pot brand purchased thanksgiving weekend. I made a chicken and rice dish from a different recipe using Jasmine white rice. I got the Burn notice twice. That recipe mentioned the importance of rinsing the rice to avoid scorching.I did that and am thinking that maybe I didn’t rinse enough or should have let the rice soak for awhile before putting it in. Does the fact that this one used brown rice lower the risk of burning? I do want to try again because chicken and rice is a great staple meal. Any tips t ok prevent burning? Winner, Winner, with this chicken dinner! Easy to make. I used a dairy free cream of chicken mix and it still came out perfect. Devoured by the toddler and the husband. Thank you! I only have a family of three so I made only half. I used chicken breast. I made my own “cream” soup since my son is allergic to milk. I was afraid it would burn after reading the comments. It turned out great at 25 minutes with brown rice. I thought it a bit bland and I would have liked more carrots. Very good though. Very good family meal! Thank you for a 1 pot recipe using brown rice instead of white. I added a bay leaf and used dried thyme because I didn’t have fresh. My very picky children ate it without complaining! Burn notice after multiple attempts (4xs). It’s too thick, and I knew it before I started it up ;( should have stuck with my gut. I was planning on making a pork chop recipe in my instant pot but after they thawed they didn’t look right so I discarded them. I had some chicken thighs and rice around so I used your recipe as a guide (I didn’t have garlic or thyme and had to use canned mushrooms) but I seasoned with adobo and it was very good! Thank you! I’m glad dinner was saved, Terry! Thanks for sharing. Hi! These should have a relatively long shelf-life in the refrigerator. I’d feel comfy keeping them in the fridge for up to 2 weeks. This recipe is not suited for my Duo Instant Pot. I have ruined dinner trying to prepare, not to mention the messy burned pot cleanup and cost of meal.. I strongly suggest you post the type of pot you are using at the beginning of your recipe(s). I am not fond of the repeated burned notices. Thank you. This was really good, easy to make! I diced the mushrooms smaller than normal because my husband doesn’t like the texture. After reading the other comments, I added an extra 1/4 c of liquid to try to prevent burning, but I definitely didn’t need to! No burn warnings, plenty of liquid, everything was super tender and not dry at all. I set it for 23 minutes. Thanks for a great recipe. This turned out great for us. Just a note about the BURN issue — we did not get this eve though it has happened with other recipes before. Great recipe, my husband and I loved it! Thanks for sharing. No burn notice using my 6 quart DuoPlus following recipe as written. This was my very first insta pot/multi cooker recipe and it turned out great! I used chicken wingettes, string beans and brown rice (Uncle Ben’s). I did add a little more chicken stock because I read all the comments about burning but I would stick to the recipe next time. I have a Crux 8 qt machine and I set it on meat/stew (there is no manual button) for 20 mins. Everything was cooked well. Next time I’ll do a bit more seasoning on the chicken or marinate it in advance but otherwise it was yummy!! I added a little extra broth, and it was still too dry when I opened it up after 25 minutes. The rice is a little gooey yet undercooked. I used regular brown rice instead of instant. Hubs and I liked it a lot, but I will add more spices the next time I make it, and a lot more fluid. Hi Hunter, we’ve never tried halving this recipe, so I can’t say for sure if it would work. If you try it, please let us know how it turns out! Never got burn notice. The trick is to layer! Gonna try cream of mushroom soup next! Burn notice, maybe the recipe needs more broth or add some water? I just tried this for the first time and it was amazing!!! After reading the comments I was afraid of the burning issue but I didn’t experience that. It was super tasty! I loved how the thyme just fell off the stems. I added rosemary also. This is a new fave!!! If I don’t have any mushrooms, can I use cream of mushroom soup instead? Thanks, I have never used this by myself and am wanting to have supper done when my husband comes home. Thank you. I really love this machine!!! Hi Robin! We haven’t tried cream of mushroom soup. I’m not sure if the consistency of the soup would work well in this recipe. But if you’re up for experimenting, please come back and let us know how it turned out! Made this tonight and it was good! Although as I was making it I questioned the 20 min cook time for white rice, since I always cook rice for 10 and even chicken for 15, but since it was a quick release I followed the recipe. The rice was very mushy, but still edible – next time I will reduce the cook time and try 15 min instead. I also checked comments for servings and thought I saw 8 servings, so I didn’t double it like I often have to do, and I should have added more rice, broth, and chicken for our family of 5. I’ll definitely make it again, just with a few tweaks! Got my Instant Pot yesterday and made this right away! So GOOD! I was amazed at how easy it was for the chicken to shred right in the pot! I cut the chicken breasts up so they would cook quicker. I used brown rice and set it for 24 mins which was perfect. THANKS! I got the burn notice too and my rice was scorched to the bottom of the pot. I have a 6 qt Instant Pot and I followed the recipe exactly. I ended up finishing it on the stove. It had a good flavor but since I finished it on the stove the rice was kind of mushy, the carrots were too firm, and the chicken was pretty dry. I don’t think I’ll try it again since I didn’t change the recipe at all. How long do you cook this if you don’t any to add the rice? Came out great! Just made way too much! How can I adjust the recipe so it makes about 4 servings? Hi Nicole, I’m glad you liked it! I’m not confident this recipe would work with fewer ingredients (you might run into that infamous burn notice!) If you do decide to experiment with less chicken, rice, and/or veggies, just make sure you have adequate liquid to get the IP to pressure. I’ve made this recipe a few times easily and my family loves it! I am also new to instant pot but the last two times I’ve tried this recipe my pot keeps saying burn! I’ve added water, stirred around, etc.. help! Am going to try, but first wanted to get your advice: since so many people are having issues with rice burning at the bottom and raw chicken, is it ok to swap placement and put the chicken and broth at the bottom then the veggies, rice and soup? Hi Taylor, we haven’t tried it like this, so I’m not sure if it would work. We’ve personally never encountered the burn notice, either, though I know a number of our readers have! Anyway, we’re all about experimenting in the kitchen. If you try swapping the arrangement of the rice and chicken, please come back and let us know how it turns out! Tasty! It is a bit bland but this is a recipe on “Super Healthy Kids”…KIDS. Made this in my Instant Pot and it worked beautifully. I followed the directions exactly as written. The only difference I had was I only had dried thyme. I’m not sure what kind of difference that might make in the taste. Super easy to make and tasty. If we don’t have chicken broth can we just use water? Hi Kristen, yes! The recipe might be a little less flavorful without the broth, but it should still turn out. Hello! I love the Instant Pot. I have 3 IP Duos and use them an avg of 5 days a week for every kind of dinner imaginable, desserts, puddings, dips, cheesecake, yogurt, etc. I have only every had one burn notice in well over a year of use when I first started and that was a thick Buffalo Ranch Dip. This recipe is my second and the worst. Don’t know if it’s the jasmine rice I used or what? i even cut the two chicken breasts in quarters, used a 1/4 cup less rice and added 1/4 c. more broth. Still burned 4 times and had to remove it all and finish in oven which I haven’t used in a year! The flavor is good, but the pot burned so badly……. Sorry. I did it exactly as you described. Are people getting the burn notice rinsing their rice before putting it in the Instant Pot? The only time I’ve ever had trouble with this recipe is when I forgot to rinse the rice. It stuck like crazy and burned the bottom. I don’t like mushrooms.. can I use broccoli instead?? Or can I just omit the mushrooms? Hi Morgan, I think it would be OK to omit the mushrooms. I like the idea of subbing in a different veggie, but I think broccoli would be quite overcooked. More carrots? This recipe is fantastic! The flavors and ingredients work perfectly together and a real budget friendly meal. Never got a burn notice. If you are not using a “instant pot” brand check a conversion chart for time differences. Other than that, make sure its mixed up and I’ve found using vegetable or canola oil helps with the rice not sticking because it has a higher burn temp so it sticks around after the sautee to help keep everything from sticking. Loved this! Just added some extra pepper. Can you tell me what the serving size is? Hi Stacie, the serving size is roughly one cup. I’m making this now and I give up..Burn notice every time! I cook A LOT in my insta pot and this by far has been my biggest flop! I’ve made pasta with no problems and followed this recipe exact..it absolutely is burning on the bottom and I did add exta liquid to it but it’s still giving the burn… I agree could be different models but just wasted dinner and 3 hungry boys now eating cereal? Can you use chicken breasts instead of thighs, and is the time different if you do. Hi Kay, I think it would be OK to substitute chicken breasts in this recipe, without changing the cook-time. If you try it, please let us know how it turns out! So delish! It worked! My first pressure cooker dish with rice. So after reading comments I followed brown rice instructions with my brand and it called for 1.5 cup water/broth for 1 cup rice and for 20 min. Rice was not mushy or burned and it was tasty! Thank you! Can I make this with out the worstishire? Really yummy! I used almond milk in the cream of chicken, and I omitted the worstishire because I didn’t have any. Used frozen mixed veggies, I will make again for sure. No burn notice, but I used 2 1/2 cups of broth. “9/4” cup of chicken broth? I’m going to have to wing it…I’m too far in, at this point. Hi there, sorry for the confusion! We made some big updates to our site over the weekend and it caused some technical issues with our recipes. Everything should be patched up now. Thanks for your patience! I can’t wait to try this! Does the leftovers freeze well? I’m only cooking for two so I’m sure we would have extra. Hi Ashley! Yes, the leftovers should freeze well. Just made this. Delicious! I did make some modifications: I added a bag of frozen green peas, I used canned cream of mushroom, brown rice, an extra tablespoon of worscestershire, and a tsp of crushed red pepper for a little kick. I saw the other comments about burning so I added an extra half cup of broth just in case with the extra peas. Husband loves it! I love it! A winner!